Wildlife nests are everywhere and come in all different shapes and sizes. They are sometimes obvious and easily seen, but other times hidden, out of reach and difficult to locate. Very commonly, wildlife babies fall, are pushed or are even blown out of their nests by a high wind. If this happens, please assess the situation. A young animal’s best chance for surviving is with its parents. The first thing to do if you see a baby animal is to step away. 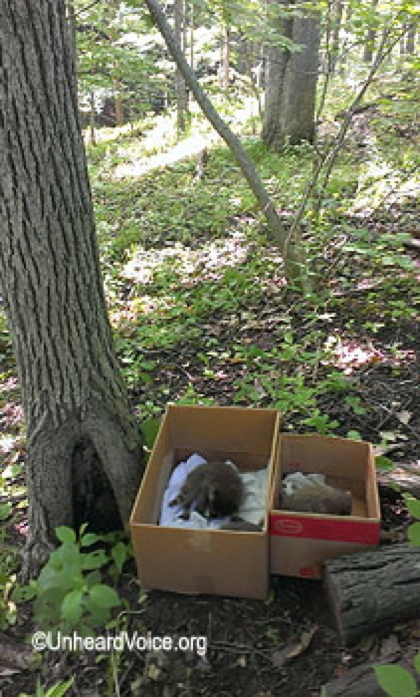 Many young animals appear to be abandoned but actually may not be, as mothers often limit their number of visits to the nesting area in order to prevent predators from discovering its location. Humans are considered predators and wild animal parents will stay away while they are in the area. If the young look content and quiet, they are probably being well cared for and should be left alone. If you find a baby mammal that is uninjured, is furred, and moving well, leave it alone, it will probably find its way back to a parent, or its parent will find it. If you see the nest, put on some gloves for protection, and gently place the baby back in the nest if you know where the nest is located. Despite the common misconception, wild animal parents will NOT reject babies if humans have touched them! Please check on the nest every so often to make sure that the parents are caring for the young. If you do not see the nest, you can create a surrogate nest to help keep the baby mammal safe, as well as to give the parents a chance to find their young. You can place the animal in a plastic container, such as a laundry bin or a Tupperware container, with holes poked in the bottom. Place natural bedding (soft grasses), or soft, 'non-stringy' bedding in the container, avoiding terry cloth or cloth that can unravel. Leave the surrogate nest under a tree near where the baby was found or attach the nest off the ground to the tree or area it was found if there are predators such as dogs and cats nearby. The nest can be nailed to the side of the house or tree, and secured to a bush or tree with twist ties, wire or duct tape. Don't hang around too closely or for too long, but you may want to check on the baby from time to time to make sure that it has found its way back to its parents. If you find a baby bird on the ground without all its feathers, and the nest is not within reach or it has been destroyed, you can build a backup nest and put it as close to the original location as possible. To make a replacement bird nest, take a container like one for margarine or Cool Whip, poke holes in the bottom for drainage, line with grasses or the original nest material and attach to the tree. You can also use laundry baskets for bigger birds. Add a heat source such as a hot water bottle wrapped in a towel if possible. Do not feed the nestling, as its parents will respond to its squawking and return to feed it. Leave the area and watch for the parents to return. If the parents do not return within a few hours, or if the animal is injured, place the babies into a covered container and leave it in a warm, dark and quiet place until it can be transported to a Wildlife Rehabilitator you can call Tufts Wildlife Clinic for help at 508-839-7918. If you find a baby and know that the parents are dead or are certain that the parents are not attending the youngster, it is likely orphaned and you will need to get the baby to a licensed Wildlife Rehabilitator or wildlife facility. MassWildlife has a list of Wildlife Rehabilitators' Association of Massachusetts for more information about licensed Wildlife Rehabilitators in your area.